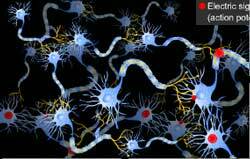 Animated Neuronal transmission : It is one of the most important function of the body. What we call our senses are impulses travelling from various parts of the body to brain. Unknow to us however there are billions of connections made to transfer info from internal organs to the brain. It is the intricate neuron cellular network that keeps our body alive. This neuronal transmission animation gives in-depth information about how our nervous system functions. What is brain made up of? What is the structure of neuron? How information transfers through neuron? How do neurons, a biological entity, create an electric signal? How electric signal pass through one neuron to another neuron, as there is tiny gap between two neurons? (1) the cerebrum,(2) the cerebellum, and (3) the brain stem. Is sleep correlated to the brain? Does your brain sleep when you sleep? Why is the brain so soft? What protects the soft brain? The human brain contains more than 100 billion brain cells called nerve cells or neurons. All neurons have same basc structure. Many number of nerves cells together are called nerve. Nerve is a pale, tough and string like structure and acts as a living telephone wire. A neuron is a long cell that has a thick central area containing the nucleus; it also has one long structure called an axon and one or more short, bushy structures called dendrites. Dendrites receive impulses from other neurons. These impulses propagate electrically along the cell membrane to the end of the axon. At the tip of the axon the signal is chemically transmitted to an adjacent neuron or muscle cell. When the electrical signal (action potential) reaches the tip of an axon, it stimulates small presynaptic vesicles in the cell. These vesicles contain chemicals called neurotransmitters, which are released into the microscopic space between neurons (the synaptic cleft). 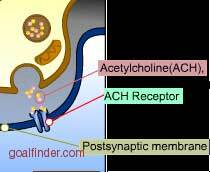 The neurotransmitters is attached to specialized receptors on the surface of the adjacent neuron. 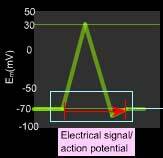 This stimulus causes the adjacent cell to depolarize and propagate an action potential of its own. 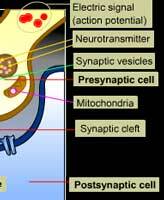 The duration of a stimulus from a neurotransmitter is limited by the breakdown of the chemicals in the synaptic cleft and the re-uptake by the neuron that produced them. Formerly, each neuron was thought to make only one transmitter, but recent studies have shown that some cells make two or more. Ans: Myelin is composed of about 80% lipid fats and 20% proteins that act as a dielectric. It sheaths the axons. Myelin sheath allows rapid and efficient transmission of impulses along the nerve cells from 5 to 30 m/s whereas an unmyelinated one transmits them at 0.5 to 2 m/s. It does this both by insulating and containing the nerves. A nerve impulse is a wave of depolarising current (action potential) that travels along the entire neuron by allowing charged ions of Na and K to flood through channels in the semi-permeable membrane around the nerve cell. At rest (resting potential), the neuron and the surrounding space act as a "capacitor" storing current that is released during the action potential. Since fat inhibits the propagation of electricity, the signals jump from one gap to the next. Ans: Bruise happens when a part of the body is struck and the muscle fibers and connective tissue underneath are crushed but the skin doesn't break. When this occurs, blood from the ruptured capillaries (small blood vessels) near the skin's surface escapes by leaking out to tissues under the skin. With no place to go, the blood gets trapped, forming a red or purplish mark that's tender when you touch it. Now since the skin is cold the warm blood leakage may cause pain. However note that the nerve cells that transmit impulses work more slowly as do the muscles controlling your fingers, low temperatures also reduce the efficiency of pain receptors, so putting an ice pack on a bruise helps to reduce swelling and damage, but also helps with the pain. Ans: Flavor is determined by the aroma (smell), taste (sweet, sour, salty or bitter quality), texture, temperature and spiciness (or irritation) of food and beverages. All of these sensory experiences together form "flavor". 75% of what we perceive as taste actually comes from our sense of smell. The average human recognizes around 10,000 different odors. Taste is to a great extent determined by smell so a loss of smell often leads to a loss of taste. When you chew your food, odors go to the back of the mouth where the olfactory system translates them into flavor. Many flavors are recognized through the sense of smell like the flavor of coffee. Taste buds allow us to perceive only bitter, salty, sweet, and sour flavors. It's the odor molecules that give us most of our taste sensation. Ans: Neural stem cells are able to produce new neurones in adults, their present and future application area are treatment of degenerative brain diseases such as Parkinson and Alzheimer, metabolic disorders, muscular dystrophies, spinal cord repair and brain tumors. They have been found to take on some of the characteristics of retinal cells and extended into the optic nerve, to build neural pathways. Ans: It is under research, In case of DHF platelet destruction happens - 1) Complement activation-virus antigens bind to human platelets in the presence of virus-specific antibody and the immune-mediated clearance of platelets was involved in thrombocytopenia 2) Virus induced suppression of bone marrow synthesis of platelet 3) In humans, virus takes control of macrophages that engulfs it and uses it for replication and transport thus causes direct destructive action of bone marrow precursor cells. Ans: For viewing full version animation, either a subscription or purchase of the animation is required. You can purchase the animation by putting it in your shopping cart (click on add to cart tab), buy and download it or simply subscribe by purchasing hours and view the animation online. Please use either shopping cart or subscription links for purchasing product or subscription; we accept credit cards, demand draft, PayPal and many other modes of payment. Refer payment FAQ for details. Ans: For viewing full version either buy and download the animation or subscribe and view the animation online. Please use either shopping cart or subscription links for purchasing product or subscription; we accept credit cards, demand draft and many other modes of payment. Ans: The chromatic aberration of the eye brings about those fringes that you see are due to refraction by our lens of light of different wavelengths and due to color opponent cells in the visual neurons. In them one part of the receptive field (e.g., the center) is sensitive to light in one part of the visible spectrum (e.g., red light), while another part of the field (e.g., the surround) is sensitive to another part of the spectrum (e.g., green light). Refer "opponent-color theory" for more info. Ans: New vesicles are re-formed from invagination from the plasma membrane and transported to the nerve terminal then filled with transmitter molecules. Syndapin I /amphiphysin /Endophilin I proteins bind to dynamin, a protein, they induce negative membrane curvature. Vesicles are attached to the membrane from which they are made by a 'neck'. Dynamin forms a helix around the neck of nascent vesicles. Its extension causes the vesicle to break away from the membrane and transported to terminal. Ans: These are short lived, small (<10mV ) and short distance signals, they weaken with distance from source while action potential travel long distance and retain the same strength throughout. Local changes in membrane potential by a stimulus or chemical messenger – receptor interaction cause them. This causes a flow of Na+ into the cell, this imbalance spreads electric potential changes along cell membranes. Are used by dendrites (for example retinal ) for returning signals from sense organs. Ans: small-molecule transmitters, neuro active peptides, chemical messengers others that are closely related but not meaning the same are synaptic messengers and cannabinoid receptors.